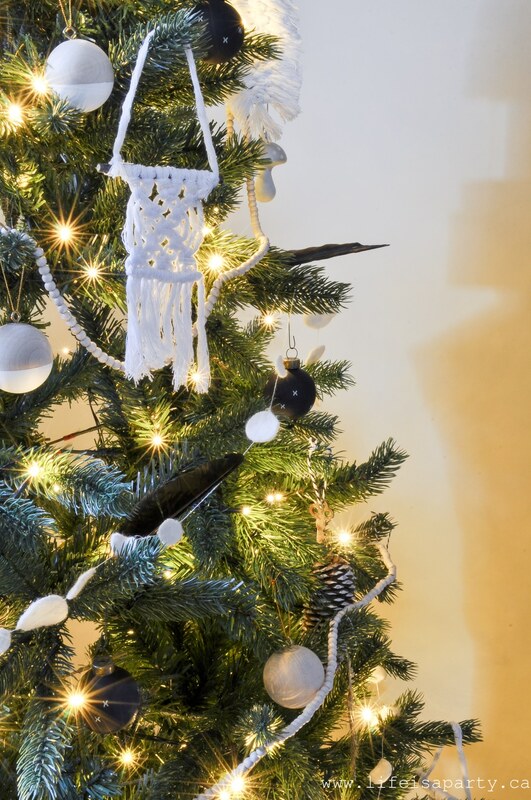 Boho Christmas Tree and DIY Macrame Feather Ornaments: black and white Boho Christmas Tree full DIY ornaments, plus a full tutorial for macrame feathers. 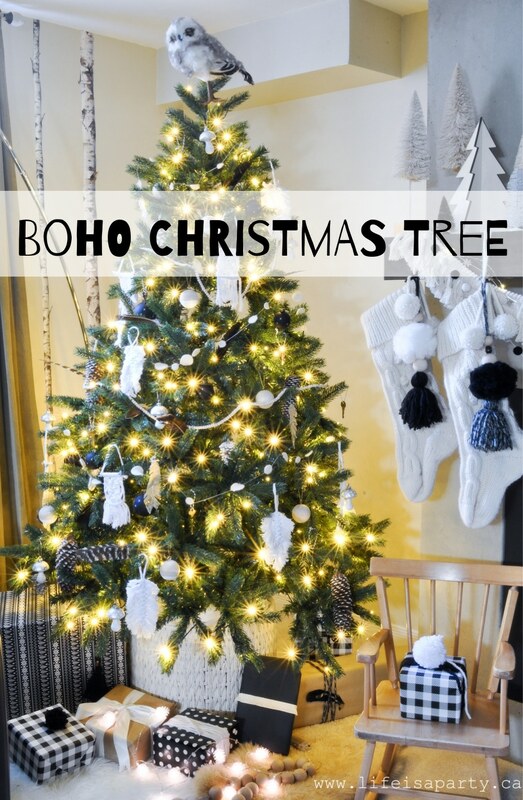 Today I’m sharing our Boho Christmas Tree for our Boho Christmas series. 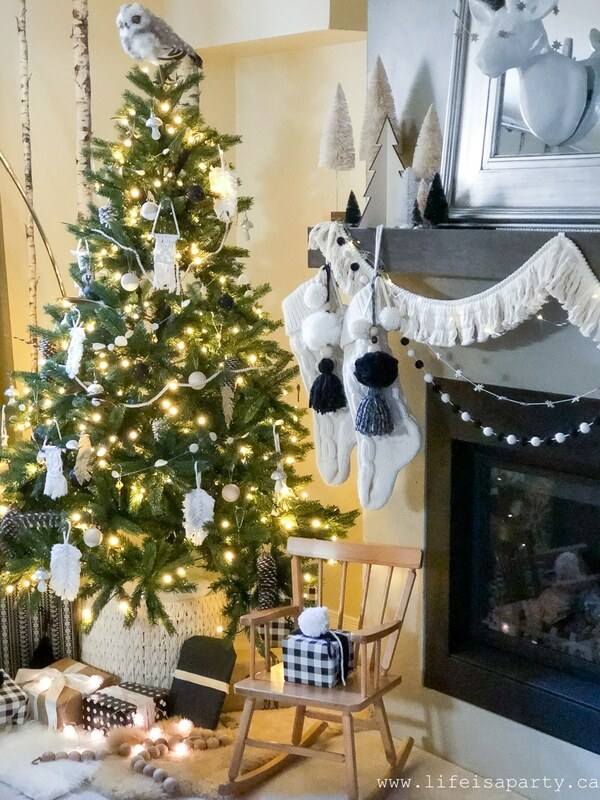 The tree was really the first thing I thought of doing when we decided to go with a black and white boho theme for our Christmas decor in our basement family room this year. 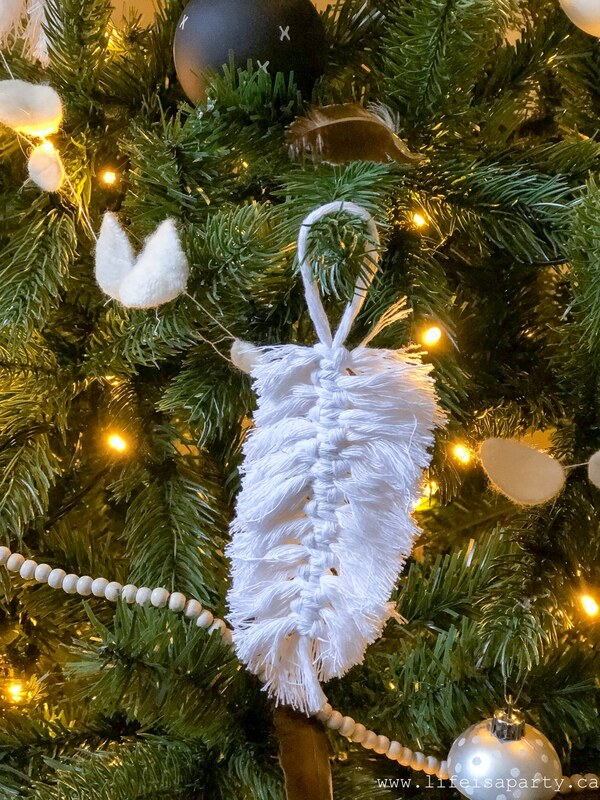 So I’m so excited to share the Boho Christmas Tree with you today all decorated, as well as a fun and easy DIY Macrame Feather Ornament. 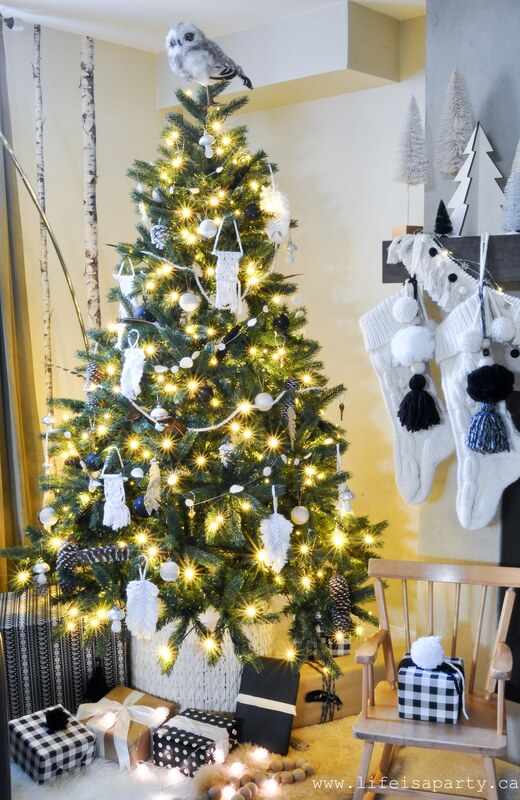 The beautiful tree is the Starlight Mountain 6′ Green Spruce Artificial Christmas Tree with 400 Clear Lights and Metal Stand from Wayfair Canada. This beautiful tree is perfect for the space. Our last tree was a hand-me-down of a hand-me-down. Our new Green Spruce is a major upgrade! This tree is pre-lit with 400 pretty sparkly lights. I’ve never had a pre-lit tree before and I don’t think I’ll ever want to go back to stringing lights after this. And the tree itself is so beautiful and real looking. The boho look always includes lots of plants and things from nature, so this real looking tree is perfect. We added a fun macrame basket to hold it in, and I think it looks great. Around it we tucked a few sheepskin rugs -very boho. There are an assortment of DIY ornaments on this tree. 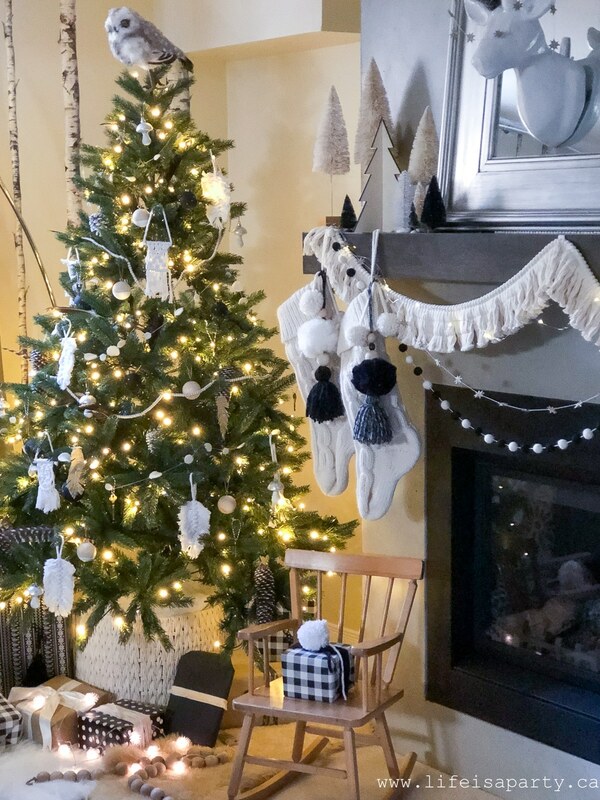 I actually love the idea of having a few little easy projects to work on for those cold winter evenings by the fire and these ornaments are perfect little December evening projects. I usually make sets of 4-6 of each kind and try to spread them around the tree. 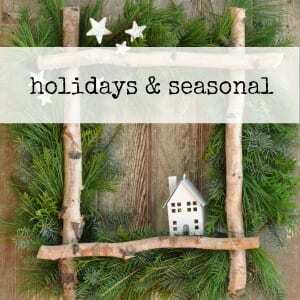 Let’s start with some of the simplest decorations. 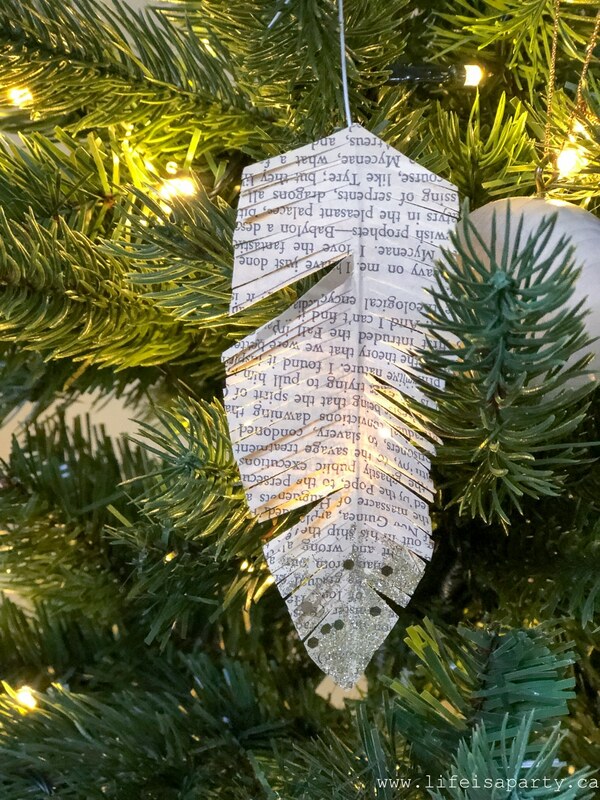 When you think boho, you think feathers -so I tucked real feathers into the tree everywhere. I made these book page feathers a few years ago -you can find a full tutorial here. They’re very simple to make, just an old book. some wire, glitter, and a few snips. I love how the little bit of gold glitter makes them feel very Christmas-y too. 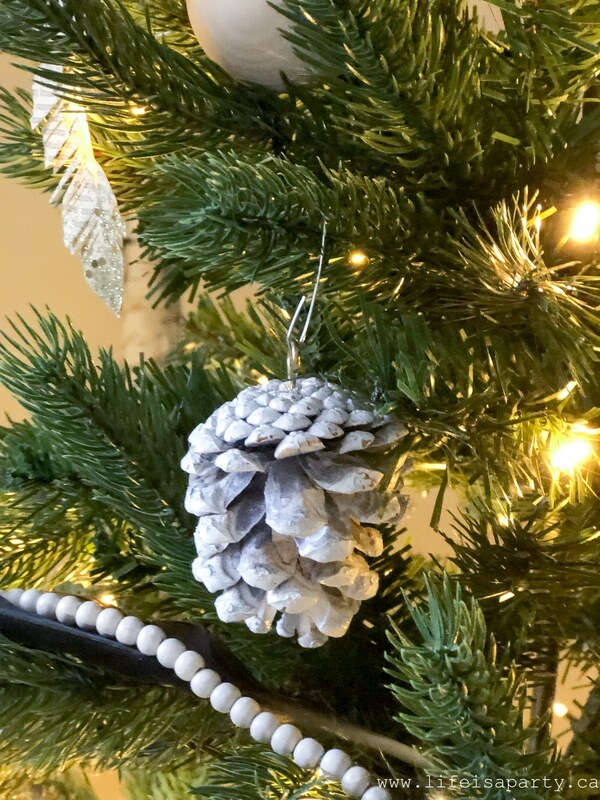 I also made these pinecone ornaments a few years ago. The long ones have some paint on the tips to look like snow, and shorter ones are all painted. To hang them I just added a little eye hook to the tops. 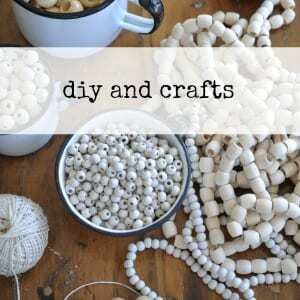 Another easy homemade addition are these wooden ball ornaments. I started with wooden balls, and then painted them, and added eye hooks to hang. 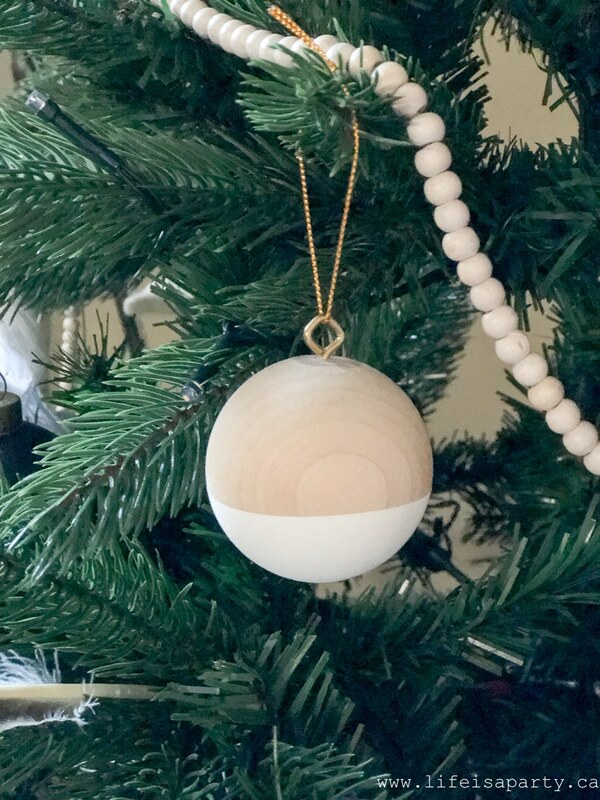 Find the whole wooden ball ornament tutorial here. 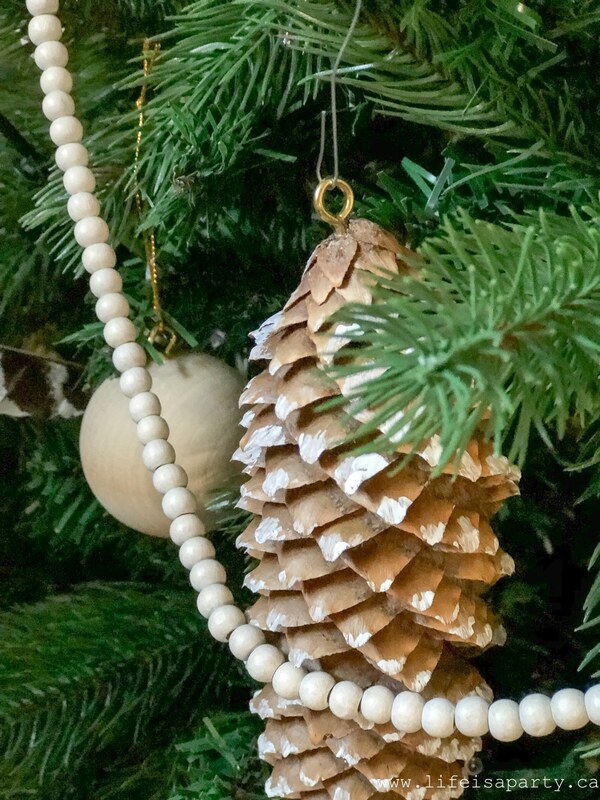 Boho often includes lots of texture and natural elements, so the feathers, pinecones, and real wood tick all those boxes. 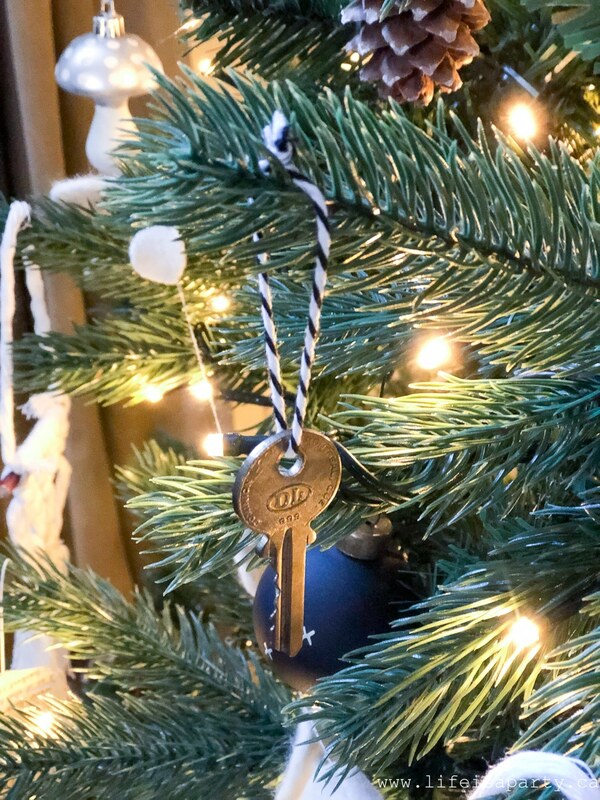 I also added a few little vintage keys to the tree. I tied them with a little twine. The boho look tends to feel very eclectic and collected over time and travels so the keys are a fun addition for that aspect. 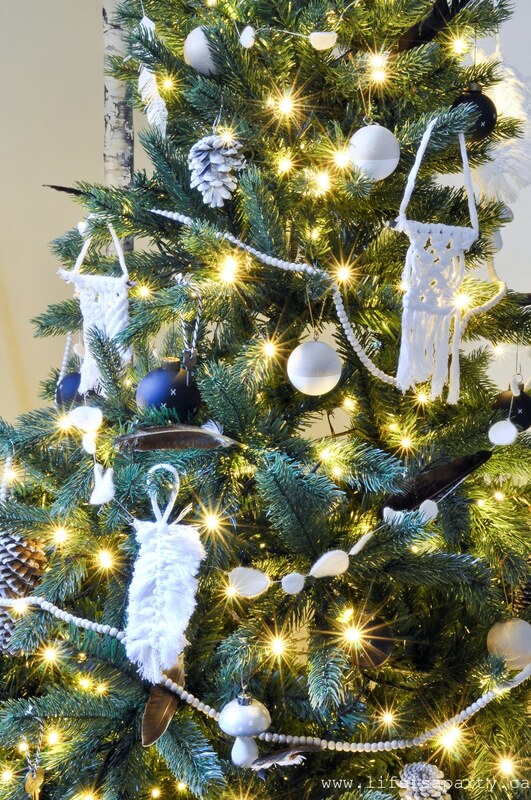 I also made some really beautiful macrame ornaments for this tree. 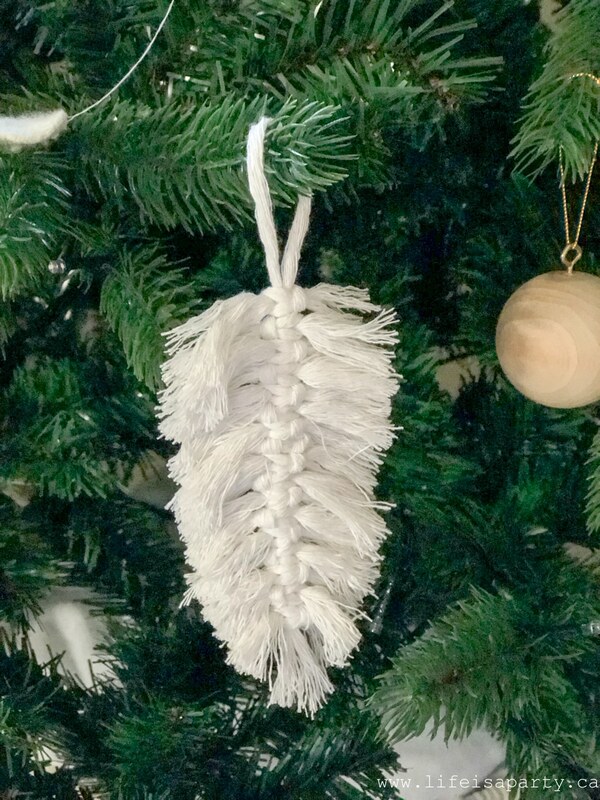 You can find the full tutorial for the mini macrame ornaments here. 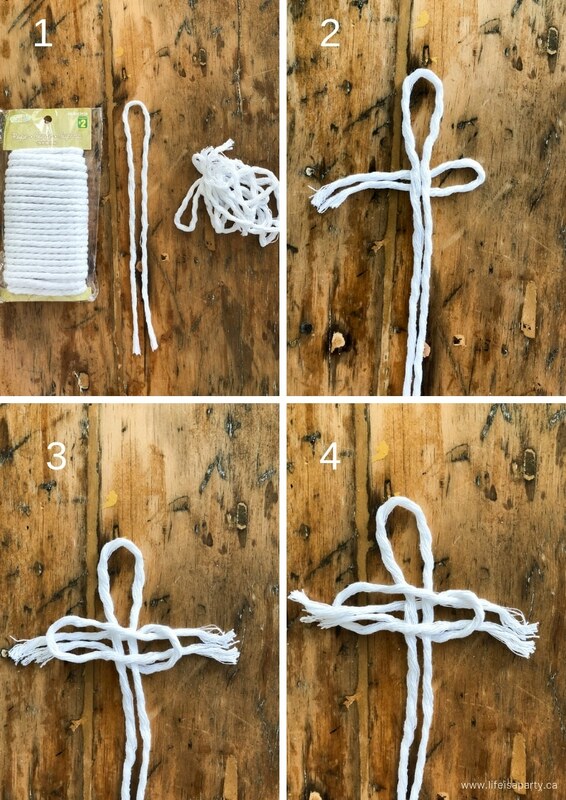 Even if you’ve never done macrame, these are really simple to make. Boho often has that 1970’s feel to it, so macrame is a great addition. And they’re so cute. 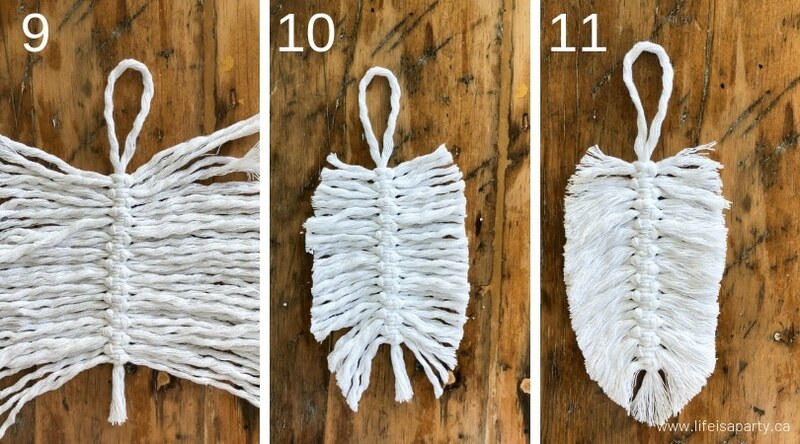 Today I want to show you these beautiful macrame feathers. 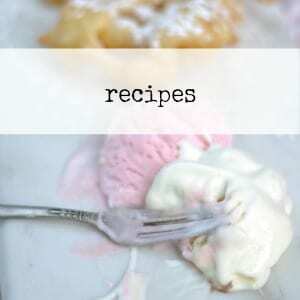 These are also really simple to make. I used three-ply rope from the dollar store, so I started by un-twisting it into single pieces of rope. You will need one longer centre piece, and then around 40 coming off from it, 20 on each side. You can make the side pieces slightly shorter, but remember if they’re too short they’re hard to work with, so easier to make them a little longer and trim the edges later. 1. Start by lying down your centre piece folding it in half. 2. Then lie the first side piece underneath of the centre one, also folded in half. 3. Next, bring another side piece folded in half, up through the loop of the other side piece. 4. Now, put the end of the first piece through the loop of the second piece. 5. Pull the ends to tighten up the knot. 6. 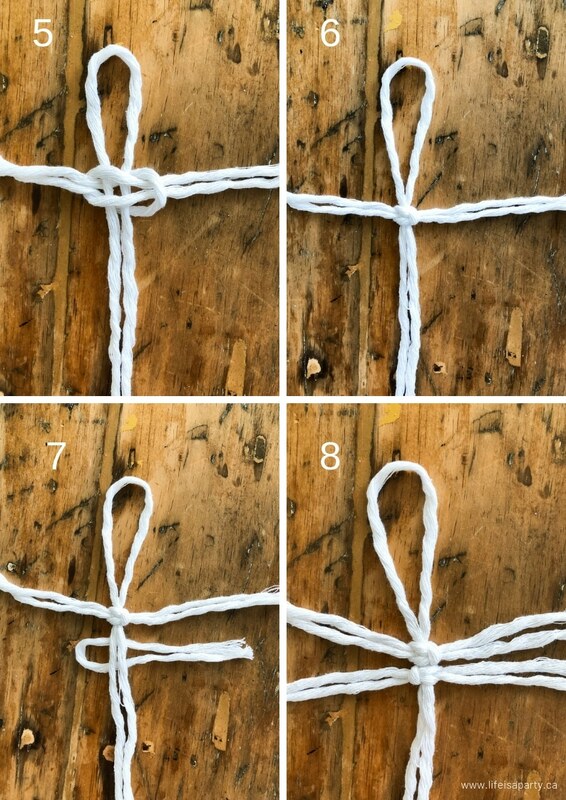 You’ve made your first knot. 7. Next, lie your side cord under the centre one again, but from the opposite side. 8. Thread a second side piece through the loop, and put the other ends through its loop, just like you did the first time, and tighten into your second knot. 9. Continue all the way down the centre, alternating each side. Pushing the knots up from the bottom of the centre piece to tighten them. 10. Trim the edges to make your feather shape. 11. Brush out the rope with a comb to create the fringe effect. 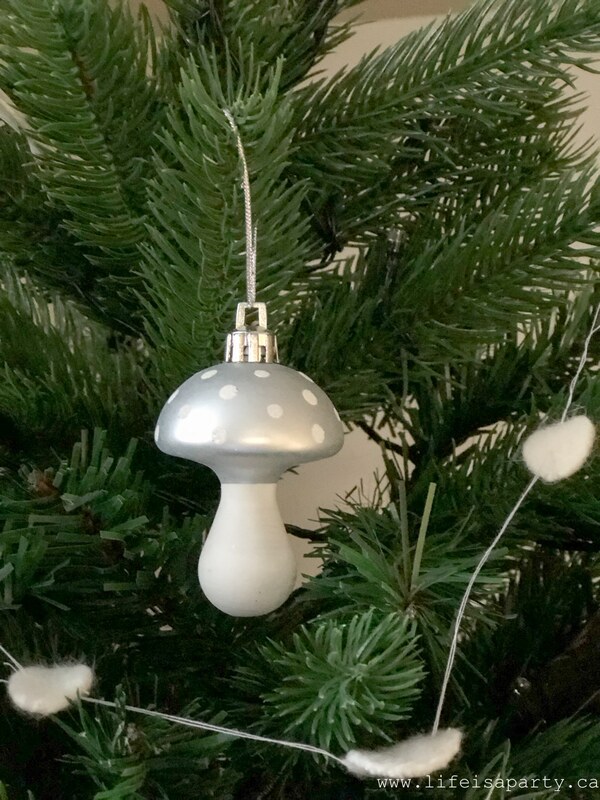 To finish the tree off, there are some pretty black ball ornaments with little x’s on them I picked up last year, and some little silver mushrooms. I kind of thing for mushrooms -and they’re so 70’s they feel boho to me. You can also see here this fun garland. It’s made out of some old white wool sweaters that I felted by washing in really hot water, then cut into little circles and stiched into a garland on the sewing machine. 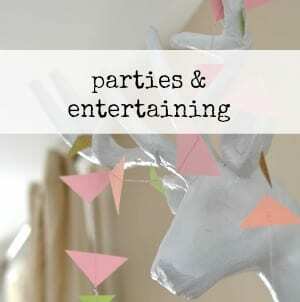 Find the felted circle garland tutorial here -one of my very oldest posts from when I first started blogging with terrible photos, but good instructions. 😉 I like the way the garland is kind of like pom poms, but a little different. 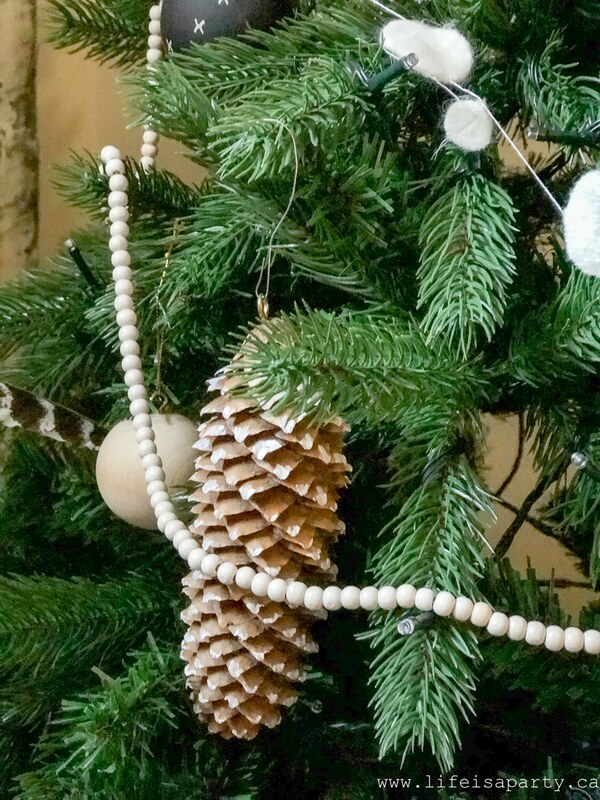 I also added some light wood bead garland to the tree that I had. Lastly, I topped the tree with a little owl. It felt kind of perfect to finish things off. 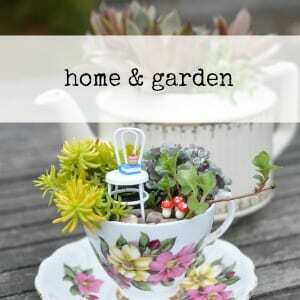 I hope this inspires you to DIY a few of your ornaments this year. Tomorrow I’ll be sharing the reveal of the whole room, and you can see how all our Boho Christmas projects come together. The room is feel so beautifully cozy, and warm. I can’t wait to spend lots of December nights here in front of the fire with my family watching Christmas movies, wrapping presents, and reading. 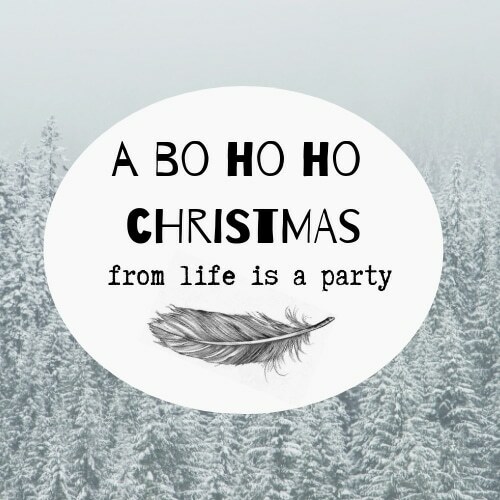 With a beautiful Boho Christmas Tree, life really is a party! This post is sponsored by Wayfair Canada. As always, all opinions are my own. Thanks so much for supporting the brands that make Life is a Party possible.